Welcome to the Tree Farm! We will re-open December 12th at 1pm. Welcome to the Spillman’s Christmas Tree Farm. Here at the Spillman’s Tree farm you can create family traditions and start your Christmas season with a beautiful pre-cut Fraser Fir; our Choose & Cut trees this year: Leyland Cypress, Red Cedar, Carolina Sapphire and White Pine. We also offer Dug Trees in Pots: Carolina Sapphire, Scotch Pine and Emerald Green. We also have decorated wreaths, garlands and tree stands for you to choose from. You will have a wonderful experience riding our wagon out to the Randleman Lake, scenic overlook to build beautiful memories for your children, families, and friends choosing your Christmas tree. Located in Sophia, North Carolina, Spillman’s Christmas tree farm is a great destination! We are convenient to Lexington, Asheboro, Greensboro and High Point. Frosty, our 40 foot snowman will appear again this year to wave at the children. He has become a friend to the young and old alike. OPENING the Day After Thanksgiving!!!! Field Trips by appointments only. Call Today to Book your Field Trip! Field Trip spots are filling up quickly! Field Trips are available for School Groups, Daycares and More! 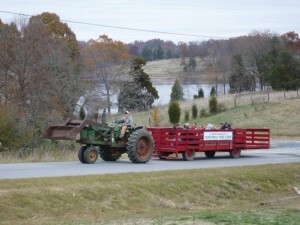 Please come and enjoy the scenic hayride of Randleman Lake! Copyright © 2019 Spillman's Christmas Trees.